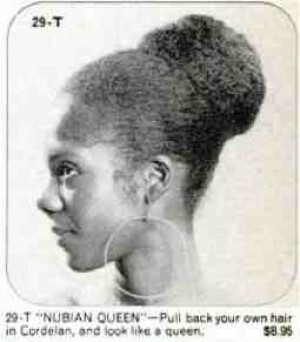 Even with the current renewed popularity of Afro hairstyles, I doubt we will see the return of any of these modes soon. 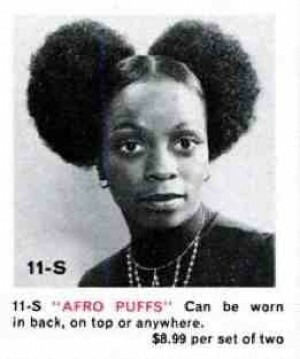 I saw 'Afro Puffs' on the news the other day. 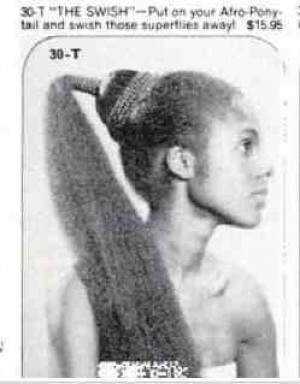 Many moons ago, I let my hair grow to beyond shoulder length and would joke that I would have it cut and made into a wig to use when I grew older. I didn't follow through and now I wish I had. The Afro Puffs look died out the instant someone spoke the words "Minnie Mouse." Wow, Paul, what a find. 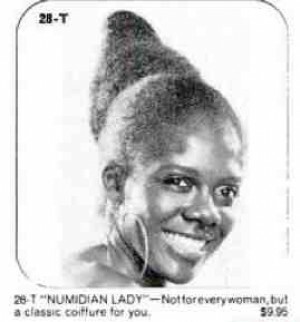 "Numidian Lady"? Whew. Best is: "...swish those superflies away..."
I'm not sure which I like better...the mouseketeer look or the horse tail look. Wigs are big money, Check out the price on human hair wigs on the net. Who knows, these may come back. Not any worse than using what looks like yarn for extensions. Some may make a comeback. One of the black characters in "Orange Is the New Black" show on Netflix has wears her hair in the "Afro Puffs" style. Some may be making a comeback. That's where I saw it!